County Connect is the foundation of the eUSAconnect network. The tools, connections and knowledge of the community are brought together through the Sygnifi Networks system. The County Connect Portal enables all residents of the community to contribute, learn about and manage information within their local network. 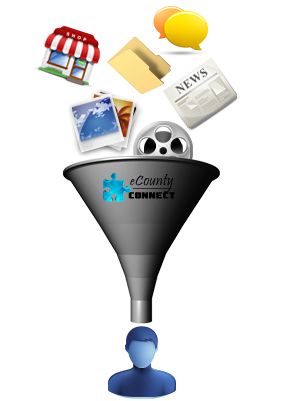 Community supporters can also contribute their stories, events and programs through the County Connect Portal or become connected themselves with web applications that are automatically fed into the network. The eUSAconnect system provides a broader outreach for news and information from the community. For example: A Connected Community Supporter (Local Chamber of Commerce) adds an Art Festival to its calendar of events and the ‘festival news’ category on its site. The information is automatically fed to the County Connect Portal to which they belong and is pushed out to the relevant trade portals (Travel and Culture portals). The information is available in all the portals and related Mobile Apps and a link is provided to the source website.